This week we mark the first anniversary of OM and it’s obvious that things are quite different now. A year ago there were hundreds of people in City Square, we had a functioning and organized campsite, a working kitchen. The IT tent had a generator and was setting up a live stream. There was drumming and singing and dancing with the Hare Krishnas who paid a nightly visit. Overseas visitors dropped in, most notably Jello Biafra from the dead Kennedys, who gave a lengthy interview on the live stream, but also people from countries like Spain and Italy who were marvelling at the fact, that Australia, too, was part of the worldwide movement called Occupy. Little did we know what was about to go down. If we ever needed proof that we were “on the money” having an occupation in the first place, this was it . The state showed its true colours, clearly fearful of might happen, if people came together to air their grievances. We were called dirty hippies in the Herald Sun, asked to get a job by those brainwashed by the Herald Sun and told we didn’t know what we were protesting against. But… the City Square eviction was only the beginning of the fight. 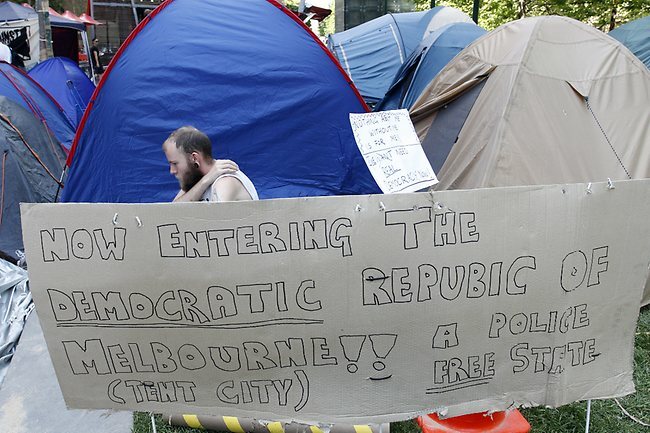 The occupation continued for another two months in different locations, notably Treasury Gardens for one month and Flagstaff Gardens for another month. The heavyhanded eviction had given the city of Melbourne such a bad name in the rest of the world, that they had to tone things down a tad: no more fences , no more riot police, just plenty of council harassment. We had battles every day, being chased by council workers who claimed that we could not have “things” in the park–lots of tense moments, some arrests, but also a lot of fun trying to outwit them. it’s a long story that will be told at another time. Obviously they were trying to break us, and while we held on for a long time, our numbers gradually dwindled. OM ended up pretty much going semi-underground in 2012, only having a small presence once a week in City Square and a small weekly overnight occupation by some diehards, which lasted through most of the winter. We were trying to work out what to do next and certainly had our difference doing it (and that’s putting it mildly). No clues came from the rest of the world, as most other occupations had also been broken up and winter in the northern hemisphere made it difficult to live in a tent camp. Most of us gave up, at some point, feeling tired, sick and disillusioned, but we were re-motivated by others and slowly direct actions began to happen on a small scale, notably the TPPA mikecheck and protest , the actions in support of Julian Assange and Bradley Manning , the rally to end all wars on September 11 and the Global Noise gathering and support of pro-choice activists. In a few days there will be a live action commemorating the eviction. On Monday we had a little anniversary celebration in City Square. 15 to 20 people maybe, but others would have been there if not for the fact that a lot of us do actually have jobs and families and lives. Still , that small gathering was a reminder of the best times we had during the past year, people having discussions about the law, where money comes from, politics, Robert Doyle and freedom. There was music , provided by a ghetto blaster and the very talented and persistent Chris Simmons on flute . Like old times , the cops came to visit, suspiciously eyeing the “things” (toys) we were giving away. I wonder whether they understand that we need them oh so badly for our comedy routines, their presence instantly doubled the fun we were having and we were sad that they left so soon. The point is, it’s not about the numbers anymore. One person with the right tools can change the world, just look at Julian Assange. While our number may be smaller at the moment, the connections between us are now deeper and we will be organising ourselves. Also, most major people’s movements of the post-war period were successful and the oppressors will continue to find themselves on the wrong side of history as they were after the civil rights movement and the Vietnam War protests. And it’s not about the physical presence of a tent city, but the fact that we are now everywhere and the so-called authorities can’t tell what we will be doing next, but one thing is for certain, the world is on the brink of financial, political and environmental meltdown and we won’t be giving up any time soon. Expect Us. Posted on October 17, 2012, in Actions & protests, Law & Government, Melbourne, Photo. Bookmark the permalink. Leave a comment.